After spending my morning driving round trip to Casa Grande and sitting through a 2.5-hour meeting, I was ready to stretch my legs and burn some energy. Luckily, we were pre-registered for that afternoon's first annual Chase the Sun Trail Run, a 10K race organized by the U.S. Orienteering Team and advertised as "a Saturday evening cruise through the trails of Tucson Mountain Park." Intimate would be a good word to describe this event. With only a few weeks of planning and with the popular Sun Run the following morning, turnout was small, but spirited. Having just a dozen racers makes for a fun, low-key atmosphere with lots of camaraderie. It was great to have fellow Tri Girl, Elaine, there along with a few other familiar faces from Tucson racing. Trail runners would call this course flat. Road racers would call it fairly flat with some small dips and a few miles of gradual incline thrown in the middle. Either way, it was a fun trail with a good amount of single track and some of the best views in Tucson. The setting sun lit up the mountains and clouds with the most amazing colors. The organizers did a great job of marking the course with orange flags denoting turns and occasional orange ribbons to reassure you that you were not lost. And I loved the quiet. It was as if we had the park all to ourselves...although some runners did meet up with crossbow-wielding hunters. I'm all for sharing the trails, but am admittedly less generous when it comes to people carrying deadly weapons. At 4:30 p.m., we were given instructions on the trail markings and then sent on our way. The pack (if you can call 12 people a pack) quickly spread out, leaving me toward the back with just one woman close on my tail (not counting the course sweeper). In a race as small as this, I find it unnerving to have someone following so closely. For the first two miles, I wondered, "Does she want to pass or does she like my pace?" When the trail occasionally widened, she opted to stay right behind me and so I finally decided not to worry about it. If she wanted to pass, she would. And, at the 4-mile marker, she did just that and opened up a 30-second or so lead that I never managed to close. My legs felt pretty crappy, which I attribute to last week's 14-mile trail run, and my arms were tired from the previous day's workout at the gym. So I just tried to keep up a decent pace while being mindful that I'm on a taper for next weekend's half marathon. With about 1/2-mile to go, Paul came trotting back down the trail - always a welcome sight toward the end of a race! He had finished about 20 minutes before me and was the first racer across the line. I found it amusing that the other Vyriotes would be the last racer across the line. Despite my dismal placing, and considering the terrain and my tired legs, I was quite satisfied with my time of 1:04. I went straight to the car to put on some more layers as the sun, along with the temperature, was dropping quickly. I then re-joined the group for some hot chocolate, munchies and good conversation. Paul gratefully accepted his winner's prize, a bottle of prickly pear syrup, and we discussed the best way to enjoy it - with vodka or tequila? This event was a nice change of pace. I hope there is a second annual race and I would highly recommend it. My compression socks are on and I'm ready to taper! That's right, it's just two weeks until the London's Run Half Marathon and until I see how well this 3-day-a-week training plan has worked for me. During this last week before the taper, I racked up 28 miles - a lot for me, especially when you consider they were done over just three days. The plan calls for a final long effort of 12 miles, but, instead, I opted to do the Tucson Trail Runners' Los Robles Adventure Run which turned out to be a variety of distances depending on how many times you got lost For me? 14 miles. "When you see the hub cap, you know you're on the right trail." "You'll come to a nice, wide trail. DON"T take that one." "You'll see a sign post, but there's no sign on top." "When you come to the second hub cap, DON"T take that trail." Shari, Rachel and I quickly realized that we were the "slow" group and stuck together with the idea that being lost is less scary when you're lost together. Lo and behold, after only about 2 miles, we missed an unmarked, hairpin turn in the trail and wandered off the course for a bit until the run director came and found us. As we got back on the correct trail, we were joined by Mike, another lost runner, making for a loyal group of four that stuck together for the remainder of the run. I owe them a debt of gratitude as they (all training for ultras) could have left me (training for a measly half marathon) in the dust at many points. There were numerous stops to pore over our maps and a few instances of backtracking, but we managed to find our way back to the start in just under 3.5 hours. Surprisingly, this was exactly the time I had told Paul to expect me. I did a lot of walking toward the end and my legs and feet are toast. However, the trails in that area are beautiful - lots of single track with rolling hills. And we began the run with an amazing sunset. I originally thought that the run should have been scheduled 30 minutes later, but it turns out that the timing was perfect. The day after Christmas, Paul and I drove out to Worcester for the annual MHC holiday gathering at Susan and Jen's. It was a small group this year, but we had a great time catching up. 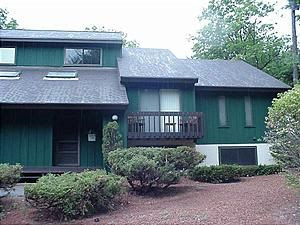 Next up was six nights at my parents' ski house in North Conway, New Hampshire. For me, this part of Christmas vacation is the most relaxing time of my entire year. Family and friends come and go over the course of the week, and the house, which sleeps 14, always seems to be full of good conversation, good food and good times. We read. We hit the outlets for the post-Christmas sales. We napped. We played Wii and board games. We played with the little ones. And we skied! While most of the others are downhill skiers, Paul and I prefer cross-country. Some days, we used trails practically outside the doorstep. One day, we drove into Jackson to the Nordic center. And Paul took me on my first snow hike up Hurricane Mountain Road, which he then skied down. The snow was fantastic and so beautiful! Finally, we celebrated the New Year with a delicious Italian feast of Eggplant Parmesan courtesy of my step-brother Jimmy. Here we are, our final photo of 2009. All in all, a very fine year. Best wishes to you for a happy and healthy 2010! My sister's family staying overnight at my parents' means that I get to witness the magic of Santa Claus. It's like being a kid again. Except that they left milk for Santa while we used to leave bourbon. "To warm him up," is what they told us. There was a flurry of gift-opening on Christmas morning. 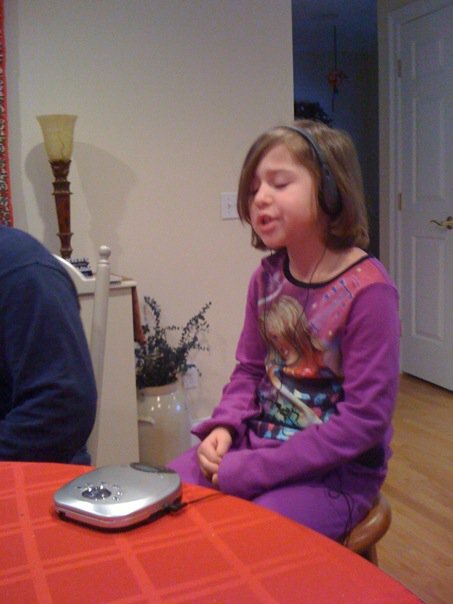 Hannah loved her new CD player and was rockin' out in no time. Emily was overjoyed with her new dolls. CJ was not the least bit impressed with Santa's offerings, but had a blast with one of the old standbys. Although not new, it was very clean as Becky had to take it apart and wash it the previous evening after CJ dumped the tray of stuffed mushroom down the tubes. And Jon showed his enthusiasm for the Patriots while enjoying Christmas breakfast. By late morning, we were loaded into cars and headed to Aunt Cathy's for a wonderful Christmas meal and the much-anticipated annual Pictionary game. I also had way too much fun playing Hungry Hungry Hippos with the kids. Love that game! Then, it was back in the cars to visit the Curtin side of the family, especially Nana who is holding her own at age 96.